I've written before about why public schools are important in North Carolina and why we chose public school for our Twice-Exceptional child. 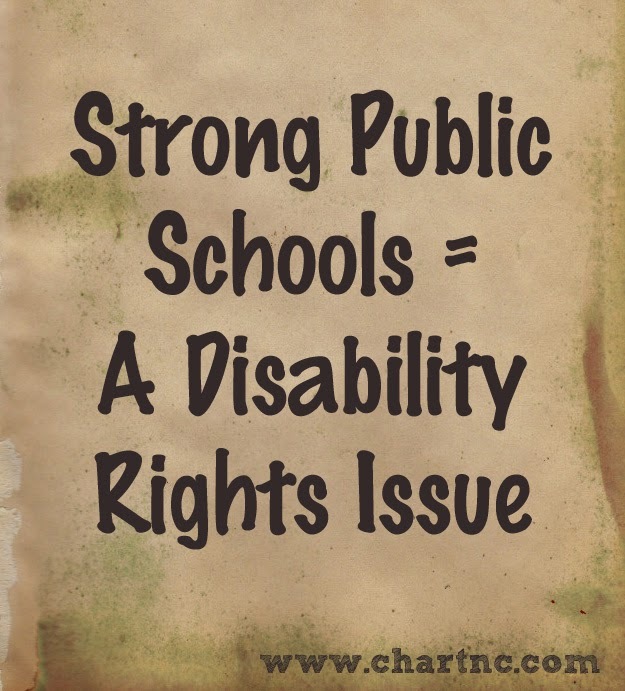 As we wrap up Autism Awareness + Acceptance Month, I want to share with you all why strong public schools are a fundamental disability rights issue. With the ever-increasing push for "school choice" - which is in reality a systemic nationwide effort to dismantle public education; (thereby funneling all of that public funding into private hands) - it is more important than ever that special needs parents realize exactly what our children stand to lose: their fundamental right to an education. Did you know that before Congress passed The Education for All Handicapped Children Act of 1975 (the forerunner of the IDEA special education law), millions of children with disabilities were routinely excluded from school and millions more were not receiving an appropriate education? Today, the IDEA law mandates that students with disabilities receive FAPE - a Free Appropriate Public Education. Public schools have to take all students in their district - private schools do not. Private schools are permitted to exclude students with disabilities. Public schools have to keep their students (barring expulsion, from which students with IEPs have certain protections) - private schools do not. Public schools have to provide a "sound, basic education" to North Carolina students - private schools are not required to have a curriculum, educational guidelines, or licensed teachers. Public school teachers must pass background checks - private school teachers do not have to pass background checks (especially worrisome when we are talking about children with limited ability to communicate if their environment is unsafe). Public schools must provide transportation as a related service if the IEP team determines it is necessary - private schools need not provide any transportation. Nor do private schools have to provide free or reduced lunches to students living in poverty. Lack of transportation and meals are insurmountable obstacles for many students. Most importantly: "A private school does not have a legal obligation to provide special education and related services for students who are children with disabilities." That is a quote from the official FAQs about the Special Education Scholarship Grants. Guess who costs even more to educate than students from low-income families? Students with disabilities. There is an inherent danger in creating schools that are drastically divided by class or level of neediness, which widens the gap between the kids who are easy to educate and everyone else. The children who can access charter or private schools are encouraged to leave the public schools, leaving behind the neediest students (special education students, minorities, and children living in poverty) - the ones that the majority of charter and private schools are not equipped to educate. Those are OUR children. And as public school funds are drained off for other enterprises, it creates a situation where the students with the greatest needs are attending schools with dwindling resources who are then ill-equipped to serve them - creating a cycle that ultimately destroys the public schools (see Chicago). This is intentional. 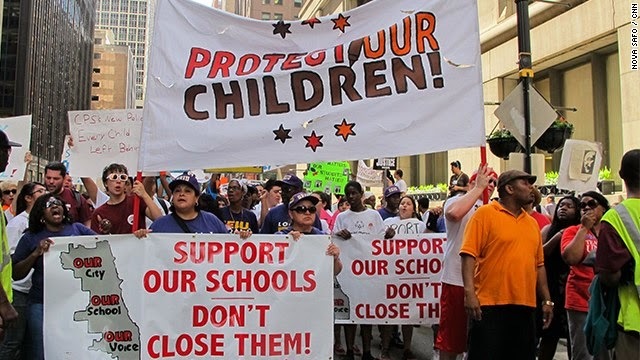 Protest against public school closings in Chicago. Image via CNN. Another issue with vouchers and scholarships is that they promote the idea that private is inherently better than public, which is not the case. In Wisconsin, the US Department of Justice is investigating Milwaukee's long-running school voucher program amid charges that it has under-served students with disabilities (remember, they don't have to take our kids). In addition, a U.S. Representative from Wisconsin has asked the U.S. Government Accountability Office to review outcomes for voucher students as compared to public school students, due to longstanding concerns about whether vouchers do anything to increase educational performance (because remember, they are not accountable for how they educate kids either). Florida's John M. McKay Scholarship for Students with Disabilities program has sparked massive school voucher fraud and abuse. These are not models for North Carolina to follow. Nor does "choice" automatically equal better. In the wake of Hurricane Katrina, New Orleans "leaders" took advantage of the devastation to completely dismantle the public school system. New Orleans is now the nation's first (and I hope the last) all-charter school district. The result has been absolute chaos and zero stability for children and communities - which is the last thing we would ever want for our children. Now all this said, there are certainly some excellent public and charter schools serving children with disabilities in the Triangle. It's not that non-public schools should not exist - it's that our public schools should not be bled dry to pay for them. Make no mistake, the NCGA is not promoting vouchers for the good of our children. If this was about providing our kids with access to schools that specialize in educating children with disabilities, the state would be supporting the Dynamic Community Charter School instead of trying to close it. No, this is part of an organized plan to destroy the public school system and divert the funds into private hands. 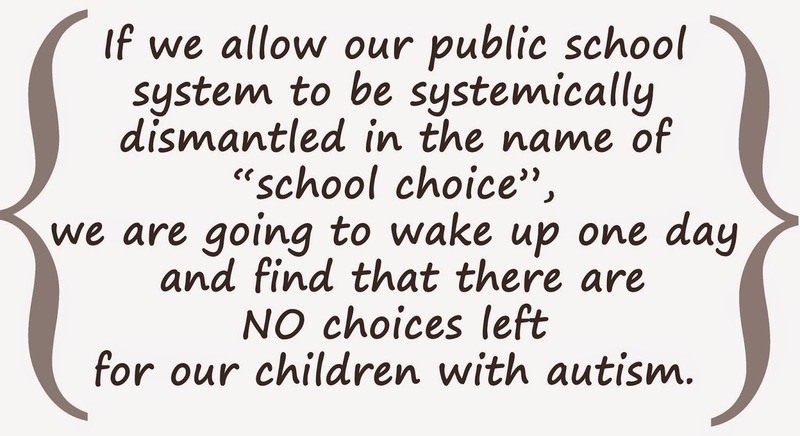 Parents and disability advocates, hear this: If we allow our public school system to be systematically dismantled in the name of "school choice", we are going to wake up one day and find that there are NO choices left for our children with autism. We are all responsible for standing up for our children's hard-won right to a Free Appropriate Public Education, in the only place that is mandated: the public school system.